It’s that time of year when Major League Baseball rolls out all the special uniforms that players will wear in the season ahead. That means pink for Mother’s Day, blue for Father’s Day, camo for Armed Forces Day, stars-and-stripes for Fourth of July and — are you ready for these — no sleeves in Cleveland for part of the All Star Game festivities? There are more special uniforms than ever around baseball, but MLB has scaled back parts of this program. There aren’t special jerseys for Father’s Day, Mother’s Day and so forth — just patches that will be sewn onto regular uniforms. The pizazz comes from the caps and socks, which we’re giving you a first look at below. They’re also only wearing some of these for one day instead of an entire weekend, such as Mother’s Day, Father’s Day and Armed Forces Day. As it does every year, MLB is donating its royalties from the holiday merchandise to charities. For Mother’s Day, proceeds go to Susan G. Komen and Stand Up to Cancer. For Father’s Day, it’s the Prostate Cancer Foundation and Stand Up To Cancer. For Armed Forces Day and Fourth of July, the league’s MLB Charities arm gives the money to support programs that support service members, veterans and military families. It’s a pretty familiar look at this point. Lots of pink. Players usually respond with pink gear beyond this too. 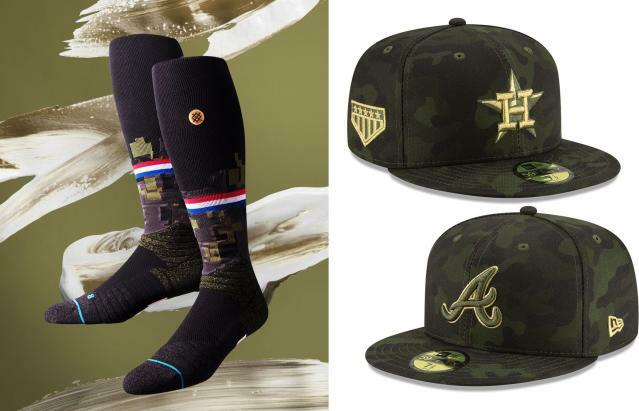 MLB is shifting the camo uniforms it used to wear for Memorial Day to Armed Forces Day, as it’s a day for celebrating the military. The league is taking a more subdued approach to Memorial Day than years past. There are no special uniforms, just jersey and cap patches. They also won’t be for sale. We wrote more about the change here. Blue is the color for Father’s Day. This year, the caps have a tie-dye/acid wash look to them. 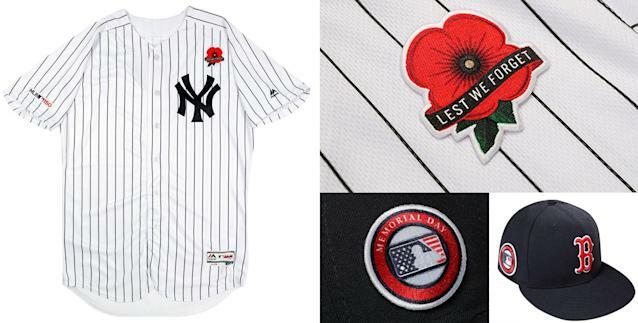 MLB is going retro for Fourth of July, using a number of old team logos in a stars-and-stripes design. This might be the most interesting part. 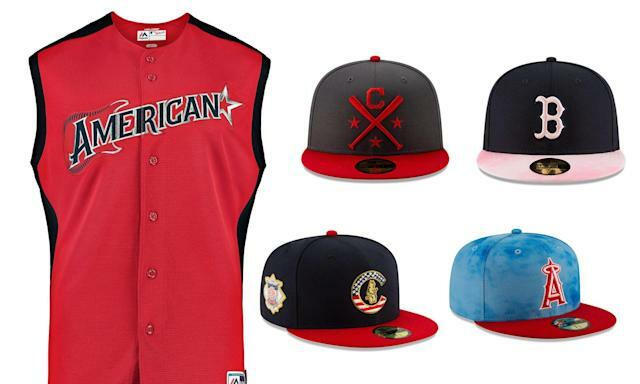 For the Futures Game and All-Star Workout Day, which includes the Home Run Derby, the uniforms are sleeveless. MLB says players can wear any types of shirt they want under the jerseys — or just go without. This means that guns could come out for the derby. A mostly traditional look for All-Star Game, with stars on the front of the cap. Most team logos look how they usually do.